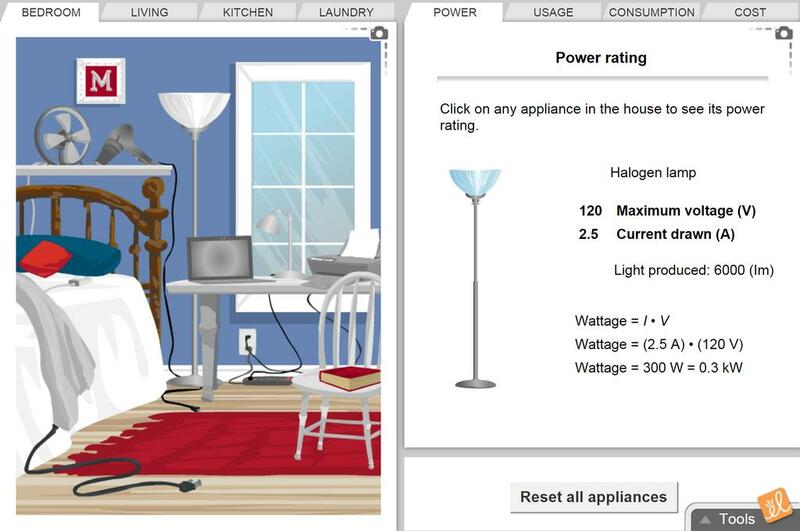 Explore the energy used by many household appliances, such as television sets, hair dryers, lights, computers, etc. Make estimates for how long each item is used on a daily basis to get an estimate for the total power consumed during a day, a week, a month, and a year, and how that relates to consumer costs and environmental impact. This worksheet allows students to deepen their understanding of house hold energy and their own consumpti... (more)on of electricity by calculating their daily usage and creating plan to reduce their usage. They state a claim and support it with evidence and reasoning. This is a modified French adaptation to the Exploration worksheet provided, but is more focused on financ... (more)ial literacy. It should be followed up with a class discussion. This is an extension to the existing lesson to evaluate the impact of time of use pricing. Students use t... (more)he Smarter Science inquiry framework to discuss the possible strategies governments may employ to modernize a large scale electricity distribution system. This is a must play for any grade 12 class! Great but should be updated for LEDs instead of halogens. This gizmo really establishes that "real-world" connection. My students even formed an Energy Club after using it! My MS science students find it hard to relate to most things in the curriculum, but they really got something out of this Gizmo! This Gizmo is a very interactive way to have students determine which of their home appliances are the most energy efficient. I use this Gizmo around Earth Day as a part of my lessons about making good decisions for the environment. I enjoy taking my 5th and 6th grade students to the computer lab to work on the Gizmos. It requires them to really think!